Multifaceted, real-world, team-oriented, with excellent prospects for the future: Six Audi apprentices explain why opting to join the premium automotive manufacturer was the perfect choice. And in recognition of Audi’s 100th birthday, more young people than ever before will have an opportunity to enter the working world at Audi. The company will offer an additional 100 slots for apprentices – primarily in the growth fields of electronics engineering and mechatronics. Burcu’s shift at the Ingolstadt site’s Press Shop starts at 6 a.m. She puts on her dark-gray overalls and work gloves, laces up her bulky safety footwear, and turns her attention to the maintenance of tools at the Press Shop. Milling, turning, measuring angles, polishing surfaces: such tasks are part of Burcu’s workday. And keen eyes are essential. At the age of 16, Matthias Kraus began his apprenticeship as an electronics specialist for automation technology in Ingolstadt. When he is 19, he will earn not only his skilled-worker certificate but also the right to study at a technical university. In other words, when other apprentices are done for the day around three o’clock, Kraus goes to class twice a week. “Attending vocational training while simultaneously qualifying to later study at a technical university is not a decision that should be taken lightly,” he emphasizes. He can play sports with his friends only on the weekend, for example. But for Kraus, who earned excellent grades at his intermediate vocational school, the dual track represents “the perfect opportunity.” After just three years, he explains, he can immediately begin studying electrical engineering and information technology at a university of applied sciences – “and once I’ve set a goal for myself, then I definitely want to achieve it.” The son of a self-employed master painter, he chose to train as an electronics specialist following an internship at Audi. “Engineering and technology simply fascinate me as well as offering great prospects for the future.” He adds that he really enjoys being a team player. In fact, he and a fellow apprentice from the Training Department are putting together an electrical control box. Kraus has been programming the controller and his colleague wiring the components. Once Anne Satzke had obtained her university-entry diploma, she knew for certain that she wanted to earn an engineering degree. “But theory alone would have been far too dry for me,” she says. During her search for an approach which blends theory and practice, she came across the StEP Program at AUDI AG. She applied – and was accepted. In September 2008, Satzke began a 13-month apprenticeship in automotive mechatronics – the first phase of a five-year program. The daughter of a motorcycle mechanic, she detects simulated errors in running engines and tinkers with test vehicles. She treasures one thing above all: “Audi places a lot of stock in training and experiential learning.” The 20-year-old technophile adds that she can always use any tool, instructors gladly help out, and specialized courses – for example, in welding – are on offer. 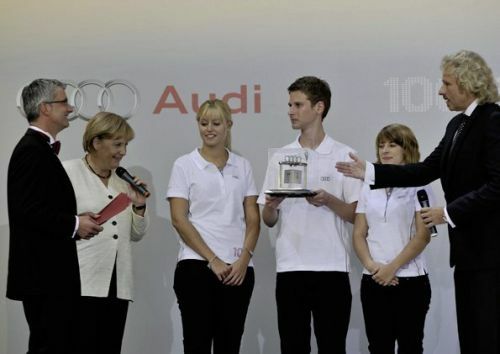 It does not bother Satzke that she is one of only eight young women among 47 StEP enrollees at Audi. Isabel Dübler, who is training in Neckarsulm to become a body-manufacturing and vehicle-manufacturing mechanic, and a few co-workers are creating a special specimen: an Audi table soccer game. “This allows me to apply acquired skills in a totally different way,” says Dübler with a smile; she hopes to finish her apprenticeship ahead of schedule and then go on to study. Industrial/technical and business apprentices alike can also gain experience abroad. Elisa Wanger, who will complete her apprenticeship as an office-communications specialist in February 2010, worked at VW in Bratislava for three months. She learned about her host country in an intercultural-awareness course and learned “survival Slovak” in a language-immersion class. The 19-year-old explains that, in retrospect, she learned the most by virtue of having to fend for herself in a foreign country. Audi is offering 100 additional slots for new apprentices during its 100th anniversary. Option of dual-track education: while simultaneously qualifying to later study at a technical university, vocational training to become an automotive mechatronics specialist, mechatronics specialist, electronics specialist for automation technology, or tool mechanic Application period for apprenticeships starting in 2010: July 30 to September 30, 2009.